NRI Radio, NRIfm.com presents the only surviving eyewitness account of Mahatma Gandhi’s historic Salt March also known as Dandi March. When Mahatma Gandhi (a lot of people spell his name as Ghandi) called Indians to break the infamous Salt Law, many people thought it to be another eccentricity of the Mahatma. In fact, It was an ingenious idea that reminded every Indian that an exploiting British government had even taxed the cheapest food ingredients like salt. By encouraging Indians to break this law Mahatma Gandhi wanted to involve Indian masses, including the poorest of the poor, to defy the unjust law imposed by an oppressive foreign government. 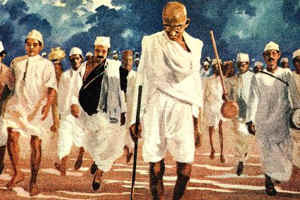 The Salt March or Dandhi March began on the morning of the 12th March 1930. A 25-year old disciple, Sumangal Prakash, was then living in Gandhi’s Sabarmati Ashram, Ahmedabad and he was one of those 78 Ashram residents whom Gandhi picked up as fellow marchers. Vijay Rana, the editor of NRIfm met Sumangal Prakash in 1985 at his residence in Pahar Ganj in Delhi. He had to search him for more than an hour and nobody in the neighbourhood knew him. Dressed in hand washed Khadi Kurta, the frail old man was living in pretty austere conditions. His sitting room barely had any furniture except a clean white bed and a broken plastic cane chair, that he offered to his interviewer. His loving old wife poured tea from an aluminium kettle. It was an humbling experience to be with them.